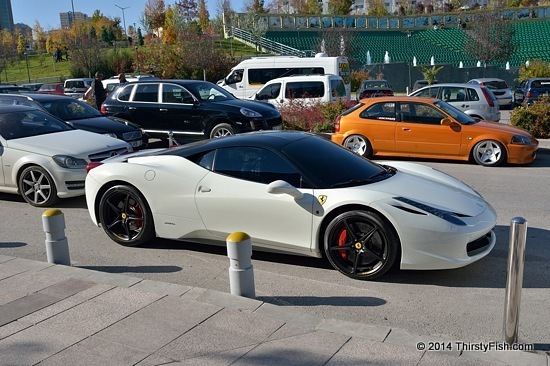 In emerging markets such as Turkey, Poland, Peru, Brazil, it is not uncommon to see overpriced supercars like this Ferrari 458 parked in front of a mall in Ankara. These are sold for upwards of 550,000 USD in Turkey. I recently came across a New York Times review of a book titled The Millionaire Next Door, by two authors who spent twenty years interviewing America's wealthy. they concluded that most millionaires do not look like millionaires, they don't have big hats, but they have a lot of cattle. They live in relatively modest houses, drive modest cars. They are well educated and mainly self-employed. Most are self-made and majority have attended public schools. They live well below their means and work hard. It's not the picture of a millionaire most people draw in their heads. And of course, there is the Wall Street and Type A personality types buying up $50,000 watches and multi-million dollar yatchs, but they are in the minority among the wealthy. There are many high income individuals who live at or above their means. These individuals are highly vulnerable and they rarely become wealthy. Where Next Door Millionaires have "go-to-hell funds" to live without working for ten or more years, those who enjoy displaying their high consumption lifestyles have little or no savings or investments. Don't believe what you see on TV! There's a lot of "Big Hats" out there.